The production capacity of 150 T/H is the popular one of them in the world for the contractors and final users. Nowdays we can find customers at Russia crushing plant, Africa crushing plant, Indonesia crushing plant, Uzbekistan crushing plant, Cambodia crushing plant, Philippine crushing plant using 150T/H Stone Crushing Plant. As the one of representative for medium range capacity crushing plants, SAMYOUNG PLANT sold this crushing plant in worldwide. Jaw crusher used to crush as primary crushing, Cone crusher or Impact crusher is for secondary crushing or Tertiary Crushing plant. Size separation of final products is done by Vibrating Screen. 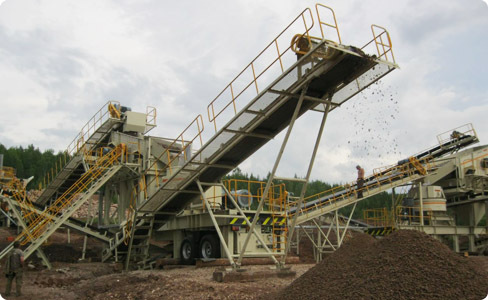 Hopper, Vibrating Feeder and belt conveyors are used for transfer crushing materials. 150T/H crushing plant has two types, Stationary crushing plant and Portable crushing plant (semi – mobile crushing plant) with wheels.